I hate February, despite the presence of the celebrated "love holiday" on the 14th. February is the month that my well-intended New Year&apos;s resolutions bite the dust, which leaves me disgusted with myself. But not this year, not after I discovered the Plainfield Recreation Center. Oh, I knew about the center: This two-story, 113,000-square-foot crown jewel stands out like a beacon at 651 Vestal Road, Plainfield, Ind. I just didn&apos;t intimately know every detail about the center until I made the commitment to use it. The Plainfield Recreation Center makes it easy to remain resolute. But this isn&apos;t your ordinary workout facility that anyone can find anywhere. No, this, like its summer counterpart Splash Island Outdoor Water Park, has become a destination. Three regulation basketball courts, with the ability to partition them off, are an obvious draw. Impressively, each court features a scoreboard, bleachers and shiny parquet floors. There are enough basketball rims for everyone. I routinely see pre-teens to senior citizens simply shooting around, but also witness full-court games. The interior red bricks that fill the walls up to the second level add a distinct classiness to the entire experience. Like the windows at Hinkle Fieldhouse or the ivy at Wrigley Field, the bricks are a memorable, signature feature. Up on that second level awaits a 1/8th-mile walking and running track with enough lanes to satisfy all speeds. Some folks mosey along, perhaps just starting their resolutions. Others move at moderate to speedy walking clips. Runners speed by as well. During invigorating walks or runs, I hear the clanking of exercise equipment, conveniently located just off the track. Don&apos;t be intimidated by the large fitness center. Again, all levels are welcome. Choices range from stationary bikes to treadmills to weight machines featuring equipment such as Life Fitness and Hammer Strength. You can even arrange personal training sessions. Admission passes vary by age and duration. There is a late-night and even a "Just Watch&apos;in" pass. 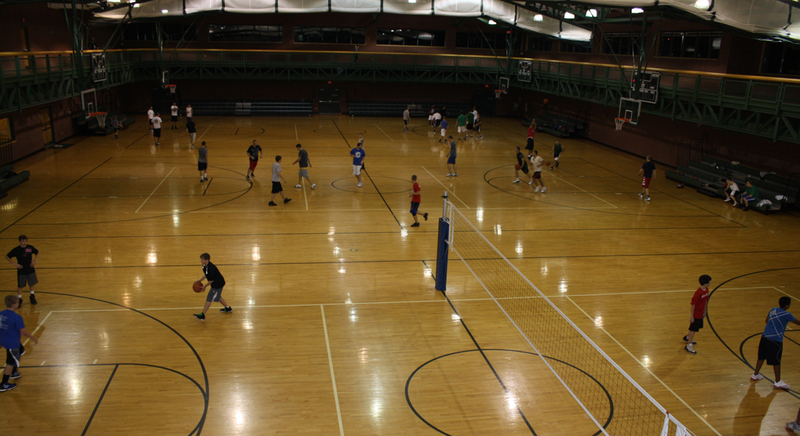 Although the track, basketball courts and fitness center are the obvious draws, the Plainfield Recreation Center offers so much more. 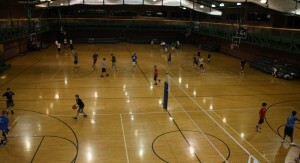 The courts can also be used for volleyball, youth soccer and more as part of the dozens of programs offered each season. Other programs include tumbling and dancing in one of several community rooms. 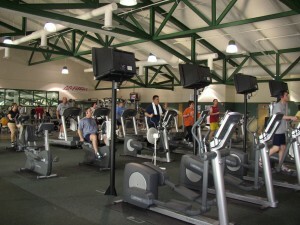 Fitness classes are conducted in aerobics rooms. One of the most important amenities for parents is Playworld, an interactive children&apos;s activity area. Ages 1-12 enjoy games and jungle-gym equipment, under the supervision of a play guard. Parents may leave children in Playworld for up to 90 minutes during a workout or program. My 12-year-old also enjoyed the nearby ping-pong table and foosball, in addition to the food and beverage choices at Snackabana Cafe. As if all this wasn&apos;t enough, the 20,000-square-foot Splash Island Indoor Aquatic Center lurks around the corner from the recreation center. I&apos;m beginning to love February after all.